The grouping that covers three continents, IBSA (India, Brazil, South Africa), is gradually getting recognised as a major player in the emerging global scenario. This may get underlined as Prime Minister Manmohan Singh interacts with the leaders of South Africa and Brazil in Pretoria on Tuesday. IBSA like BRICS (Brazil, Russia, India, China, South Africa) has come up as an effective grouping capable of influencing the course of events at the world level. Hunger is not catchy enough to attract eye balls of those who could turn it into a political debate. Though it affects millions, it is not a matter of concern in a democracy of a billion people. JOKES about bodily functions and toilets are infra-dig once one is out of kindergarten. That does not mean that toilets themselves are out of bounds for electioneering. In fact, leaders seem to have smelled a captive audience and the consequent electoral opportunity there. Nepal Prime Minister Babu Ram Bhattarai will be on an official visit to India for three days in the third week of October. He had a meeting with Prime Minister Manmohan Singh at the UN and the latter had reportedly expressed India’s support for completing the peace process in Nepal. After all has been said and done about the babas and their black sheep of the civilian world, there is plenty left to say about those in the armed forces. I witnessed expression of faith in divine defence personnel for the first time while exploring Sikkim. In the name of providing hassle-free travel to commuters, some roads were handed over to private players in Punjab in 2006 under the 'Public Private Partnership' (PPP) mode, allowing them to collect toll. Apart from the national highways, toll is levied through 16 toll plazas on 10 state roads, two of which are under O & M (Operations and Maintenance) and the other eight under the BOT (Build Operate and Transfer) category. The grouping that covers three continents, IBSA (India, Brazil, South Africa), is gradually getting recognised as a major player in the emerging global scenario. This may get underlined as Prime Minister Manmohan Singh interacts with the leaders of South Africa and Brazil in Pretoria on Tuesday. IBSA like BRICS (Brazil, Russia, India, China, South Africa) has come up as an effective grouping capable of influencing the course of events at the world level. It is not without reason that the IBSA Fund has been given the UN Millennium Development Goal award. IBSA plus Russia and China, which constitute BRICS, together carry considerable weight. This, however, does not mean that IBSA should function only as part of BRICS. Both have their own significance, as Dr Manmohan Singh pointed out on Sunday before leaving for South Africa. The discussions at Pretoria may have their impact on the issues that may be taken up at the coming G20 summit in France. The greatest worry for the world today is the economic slowdown in the West. It must be reversed as soon as possible to prevent the scenario from getting worse. The Barack Obama administration is working overtime to successfully handle the economic woes of the US as the crisis may adversely affect his victory chances when he will try his luck for a second term in the next presidential elections. The European Union, too, is using all the resources at its command to bail out the European economies in trouble like those of Greece, Spain and Portugal. But all eyes are fixed on India and China, the two key members of BRICS, which may have to play a more aggressive role for stabilising the global economy. India must use the opportunity to ensure that it gets its due in the UN system. It has a solid case for the Security Council’s permanent membership which must be highlighted at the Pretoria summit. There is also need to get IBSA’s support for the new role that India has got to play in the peace process in Afghanistan. It is in India’s larger interest to see to it that the recent happenings in West Asia also come up for discussion. The countries affected by the Arab Spring are looking towards India particularly for laying the foundations for a democratic order in the Arab world. Hunger is not catchy enough to attract eye balls of those who could turn it into a political debate. Though it affects millions, it is not a matter of concern in a democracy of a billion people. Since the political discourse is limited to data and figures, which goes gung-ho with its record bumper crops and overflowing stocks of foodgrains, year after year, the feeble voices of hunger and malnutrition are ignored in this self- congratulatory din. Agricultural imports have quadrupled since the opening of imports, but it has affected rural livelihoods — coupled with rising inflation, it has drastically reduced the quality of food consumed by the rural. In times when the Planning Commission has declared Rs 32 to be good enough to keep an Indian above poverty line while the high growth rate is sustained, it is only ironical that the UN counts India among the seven countries where two-thirds of the world’s hungry live. In the much-talked about “The Argumentative Indian,” Nobel Laureate Amartya Sen wrote, “ About half of all Indian children are chronically under-nourished and more than half of all the adult women are anaemic, more than in Africa. Africa still manages to ensure a higher level of nourishment than India.” India is the only country where hunger and malnutrition are not sporadic; they are a constant. We had known it all along, but a country of 7 per cent growth rate has problems digesting the fact. Though the government likes to live in self-denial, as far as the existence of hungry-India is concerned, the fact cannot be ignored that while 10,688 lakh tonnes of foodgrains rot in ill-managed FCI depots, and buffer stocks exceed hundreds of millions of tonnes, millions of Indians go hungry because our PDS (public distribution system) remains incorrigible. There may not be sensational starvation deaths to get media attention, malnutrition is raising a generation which will require more investment on health care in future. The government should pay attention to the modernisation of agriculture to create more avenues of livelihood in the rural areas so that 70 per cent of India’s population can go to sleep with a filled stomach. JOKES about bodily functions and toilets are infra-dig once one is out of kindergarten. That does not mean that toilets themselves are out of bounds for electioneering. In fact, leaders seem to have smelled a captive audience and the consequent electoral opportunity there. A report from Faridkot in this newspaper reveals that the SAD-BJP government has now started pasting cyclostyled messages at the entry gates of toilets in rural areas, singing praises of the state government for providing these for the poor sections of society to help them live with “self-respect”. Now, flush latrines are indeed such a “luxury” in the rural areas that the attempt to cash in on them is understandable. Things have come to such a pass that a tug of war has started whether the credit should go to the Akalis, or to the Congress at the Centre, considering that this welfare scheme was part of the 14 flagship programmes of the Congress-led UPA government. It will be better if the two parties first ensure that the literacy rate is high enough for the users to read the writing on the toilet wall. One just hopes the self-congratulatory notes on the doors of the toilets do not find their way in, lest people complain of politics invading every dirty business. At least they should refrain from printing leaders’ pictures so that the evacuation plans are not adversely affected. But politicians being politicians, these hopes are more than likely to be belied. If the media advisers tell the leaders that votes are where the toilets are, you may find mug shots of leaders on the mugs in the cubicles. After all, if these can be on bicycles and utensils, why not mugs? Thank heavens that it is not customary in Punjab to use toilet papers. Otherwise, someone might have even come up with the idea of printing leaders’ smiling visages all along the length of the rolls. Mr Bhattarai will have both economic and political agendas when he meets the Indian Prime Minister. In the political agenda, the peace process, and India’s support for its successful completion are bound to have the highest priority. Prime Minister Bhattarai will probably want to be re-assured of the Indian government’s backing for the ongoing peace process in Nepal so that the configuration of political forces in Nepal remains conducive to the promulgation of a new democratic constitution at the earliest. A politically stable Nepal is in the interest of both Nepal and India, the South Asian region as a whole, and also Nepal’s northern neighbour, China. We, therefore, feel that India and other concerned international powers would be well advised to use their friendly influence, jointly or severally, to persuade all political formations of the country to agree to complete the peace process and strengthen national institutions for Nepal’s stability, democracy, development and progress. On the economic side there are two major issues that are of concern to Nepal both from a short-term and long-term perspective. First, the rising imbalance in trade between Nepal and India, a problem that requires urgent and cooperative corrective action. In the short run, Mr Bhattarai will perhaps ask for the removal by India of the non-tariff barriers which crop up from time to time to hinder the flow of Nepal’s exports to India. Internally, to boost production and reduce supply disruptions, the Nepal government has to rein in trade unions in both industrial and transport sectors where Mr Bhattarai’s own party remains influential. The other major issue pertains to the Nepal-India trade arrangements and the need, from a medium-term to long-term perspective, for Kathmandu and New Delhi to engage in discussion to work out a new model of interaction that will lead to the sharing of prosperity through adequate spill-over in Nepal of India’s high economic growth rate in the form of increased exports of Nepalese products to India, and vigorous flow into Nepal of direct investments by Indian companies. In this context, the India-Nepal trade treaty, signed in the mid-1990’s, which had helped increase Nepalese exports to India and also Indian investments in Nepal, could be the model. On its part, the Nepal government should create a receptive political and economic environment for investment by Indian business houses. The two governments should jointly discuss ways and means of reviving the liberal trade and investment regime of the mid-nineties. Proper, mutually agreed harnessing and utilisation of Himalayan water resources will be to the benefit of people in both countries. Economic growth in the Gangetic plain of India with over 400 million people will require an increasing volume of water for irrigation and power, and for industrial and urban use. Himalayan waters are the most important natural resource of Nepal that must be tapped for energy, irrigation, navigation and flood control for Nepal’s growth and development. Utilisation of this resource should be viewed in an integrated manner for the benefit of the people of both countries. In doing all this, experiences of the past, which still rankle in Nepalese minds, must be borne in mind. Flood-control measures in the border areas, which cause inundation or other damage in one or the other country, must be avoided. Water resource utilisation models of the 1950’s are no longer relevant. An independent non-governmental agency, with participation from the apex organisations representing industry and commerce in both Nepal and India, could be set up to look at the issues of trade and water resources in a holistic framework and come up with suggestions that are geared to new realities. In a study of this kind, the necessity of involving Indian states of Bihar and UP, the two states that have the most interest in the way the Himalayan water resources are harnessed, should be given due consideration. In a short-term perspective, however, Prime Minister Bhattarai may sound India for the export of power to Nepal for the next four or five years till the new hydro-projects in Nepal, now being constructed with both Nepali and foreign capital, become operational. India should consider any such request favourably. One important issue that has been of concern to India is security. The two countries have not been on the same wave-length in their perceptions of the term “security”, and misunderstandings persist in this regard. Nepal is an independent and sovereign country that borders the two would-be super powers of the world in the 21st century. This is a ground reality. Another ground reality is that Nepal’s long border with India is an open one, and there have been cases of infiltration of undesirable elements that have carried out activities against the national interests of both nations.. There was also the high-jacking of an Indian plane from Kathmandu airport by terrorists. While China’s interest in Nepal and the importance of Nepal-China relations is to be recognised and understood, India’s concern about undesirable activity, across the open border, must also be given serious consideration. Nepal should leave no stone unturned to ensure that Nepali soil is not used for any kind of terrorist and other destructive and undesirable activities directed against India. In this context, Nepal and India had signed, more than a decade ago, an agreement to institute a monitoring mechanism ( record keeping and a registration system, etc) all along the border without giving up the traditional free border concept between the two countries. That agreement should be reviewed with a view to its operationalisation. Our open border should continue to be our strength and not become a source of undesirable activities harming Nepal-India relations. In a fast-changing world, it is incumbent on the leaders of the two countries to start a new era of understanding and cooperation that takes cognisance of the changing dynamics of economic and power relations in the region. This would mean, in our view, efforts by both countries to promote the idea of “shared prosperity” as an umbrella concept for their relations in the 21st century. Adjustments are needed in the perceptions and thought processes of both countries. While India should re-examine the existing assumptions defining its unbalanced economic relationship with Nepal, the latter’s political elite should, in the context of the present geo-strategic realities, forge consensus and unity and shed the “small nation psychology” to define Nepal’s national interests with clarity and vision, so that India as a close southern neighbour comes to trust the capability and strength of the Nepali state to remain sensitive to its vital interests. Mr Rasgotra is a former Foreign Secretary of India; and Dr Lohani is a former Finance Minister and Foreign Minister of Nepal. After all has been said and done about the babas and their black sheep of the civilian world, there is plenty left to say about those in the armed forces. I witnessed expression of faith in divine defence personnel for the first time while exploring Sikkim. The road from Gangtok to Nathu La, on the India-Tibet border, is marked by signs pointing you to Lake Tsomgo and Baba Mandir. Now, I am a pretty reluctant visitor to places of worship – particularly the dial-a-shrine variety. That they will be a casualty on time-bound itineraries is an undeniable reality. But my cab driver would have none of it. Thus I made the acquaintance of Capt ‘Baba’ Harbhajan Singh of the 23rd Punjab battalion, at a shrine built to mark the spot where he fell to his death in 1968, while leading a pack of mules to a remote outpost. His body was recovered three days later. Legend goes that he appeared in a colleague’s dream, led the search party to the spot, and requested to be enshrined. Revered as a protector of soldiers, he is expected to forewarn them in the event of war imminence or natural disasters. Baba continues to draw his salary and enjoy the privilege of annual leave. Lest you believe his legend is confined to the Indian Army, let it be known that Chinese soldiers, too, reserve a chair for him at all meetings. Two decades later, Om Prakash, another soldier manning a sensitive border post in J&K, beat back an enemy attack single-handedly. What became of him remains a mystery, but troops posted at the Siachen base camp are of the unshakeable belief that he is their guardian deity. OP Baba’s (as he is fondly called) memorial is a short distance from that snout of the Siachen glacier that melts to form the Nubra river. A formal military report is presented to him before, and after, each glacial mission; while troops give up consumption of animal protein, alcohol and tobacco during their stay. The Plateau Nath Baba Mandir in Kargil has a somewhat diverse parable associated with it. Ingeniously named after the topographical feature the said Baba resided on, story goes that enemy shells refused to explode around him, but did so when immersed in the river; leading troops to believe that the nameless mad man was indeed a divine being. Presently a Shiva temple, maintained by the Army, stands near his hut with an ante-room dedicated to him. My initial amusement at this tradition stands overwhelmed by the realisation that in conflict zones and inhospitable life conditions, Hope is your best friend. And Faith? Your law of survival! A state toll policy prescribing base rates, annual hike, time period for collection and other guidelines was formulated through an Ordinance passed in July 2004. While the toll collection on the Phagwara-Ropar and Nakodar-Jagraon roads being under the O & M category will come to an end by 2014, the same will continue till 2023-24 on the remaining eight roads. Five years down the lane, this "tolonomics" though is working unreservedly to the benefit of the concessionaires, but has virtually turned out to be an eyesore for commuters, thanks to the prohibitively rising toll rates, frequency of toll plazas, faulty collection system and mismanagement of toll booths. Every other day some incident of violence is reported and queues of vehicles can be seen on either side of the toll plazas causing utter chaos and making life a hell for commuters. The state toll policy, on the one hand, is in contravention of the national policy in many ways, it seems more in favour of concessionaires than commuters. The base rate for a car, according to the national toll policy, is 65 paise per kilometre for a four-lane highway, which is to be reduced by 60 per cent to 39 paise per kilometre in case of a two-lane highway. Though the base rate per kilometre for a car was fixed at 35 paise per kilometre under the Punjab policy, it has more than doubled to 80 paise per kilometre in just five years, which is the highest as compared to what is charged on similar roads in other parts of the country, thanks to the formula allowing an annual hike. Whereas the national policy allows an annual hike of just 3 per cent over the base rate without compounding, the state policy has linked it to the Wholesale Price Index (WPI) after compounding, which is leading to sharp increases every year. This hike is in addition to the annual hike of 10 per cent every year, which has to come into effect from April 1, 2011, for a period of seven successive years. Due to the absence of a cap on the upper rate per kilometre, the rate of toll is expected to surpass the per kilometre fuel expenditure of a car in a few years. On the opposite, a commuter has to pay Rs. 197 for the whole journey by car on the 407-kilometre two-lane Hanumangarh-Kishangarh highway built by RIDCOR in Rajasthan, which translates into 48 paise per kilometre, nearly half of what is being charged in Punjab. These exorbitant rates accompanied by a thick density of traffic in the state results in the collection of a princely sum every day. Though official figures for the total collection could not be obtained, individual surveys conducted on selected roads lead to the conclusion that roughly Rs. 70 to 80 lakh is collected every day from the toll barriers on the state highways alone. If the collection from the seven-odd barriers on the national highways is also taken, the pockets of the people in the state are lighter by Rs 2 crore every day! The single toll plaza at Ladhowal near Ludhiana on National Highway-1 fetches a daily collection of Rs 35 lakh. Regarding the frequency of toll plazas, the national policy provides for a minimum distance of 65 kilometres between the two plazas but in Punjab many of them are located within a range of 25 to 30 kilometres as the state policy had kept this distance at 20 kilometres. Even the toll plazas set up on the national highway NH-1 at Dhilwan and Manawala are against the national policy and no objection has been raised. Furthermore, though the state policy states that if any ROB, RUB or tolled bypass becomes part of the newly paved toll road, such toll plaza has to be merged with the toll plaza to come up on the new road and the toll being charged on that ROB, RUB or bypass will be merged into the toll of the new plaza after slashing it by 30 per cent. 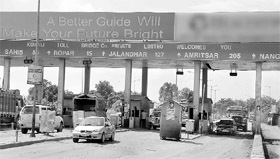 But the Kurali bridge toll plaza co-exists with the newly erected toll barrier at Solakhian on the Kurali-Ropar stretch, for which a commuter has to pass through two toll plazas within a distance of 10 kilometres and doll out Rs 36 for a journey of 11 km for the road and another 11 rupees for the bridge for a car. The validity of a toll slip for a double-trip journey is another issue where people of the state are fleeced as it expires at 12 at night at most of the toll plazas, where as the national policy provides for the validity of 24 hours. A commuter is also overcharged for a double-trip journey as he/she has to pay 160 per cent of the single trip, whereas s/he should be charged 150 per cent under the national policy. The financial burden apart, these toll plazas are points of inconvenience, traffic jams and delays, thanks to mismanagement and a faulty collection system in place. The number of toll booths on each plaza being two or three for each lane is insufficient in the wake of traffic volume in the state. Manual ticketing being the only mode of collection at booths leads to greater time wastage in the process of charging and returning change. A commuter has to purchase a new ticket at each of the plaza on the same journey, which is laughable in the modern world of advanced IT. The hand-held machines for vehicles in a queue, prepaid coupons, single ticket for all plazas for a commuter passing through multiple plazas are the simplest solutions to ease the problem. Furthermore, placing a barcode on the wind screen of the vehicle and routing the bill to the commuter either through his debit or credit card or through the mobile bill by tying up with mobile phone companies are quite plausible. Methods are galore for quicker and efficient collection, but alas none is put to use as it is the public and not the concessionaire who is at inconvenience. In the light of these facts, the state toll policy needs an urgent review to rationalise the toll rates to the level of genuine user-charges and not allowing these to become usurious by fixing an upper limit. The distance of 20 kilometres between the two toll plazas is too less and should be aligned with that provided in the national policy. The Hanumangarh-Kishangarh highwy in Rajasthan has six toll barriers on the whole route of 407 km, which makes the average distance between the two toll plazas to more than 65 kilometres. The collection methodology also needs to be made more efficient and convenient by making use of technology and concessionaires should be held responsible for delays and traffic jams by appointing appropriate monitoring authority on these toll roads. This is the need of the hour for the sake of public convenience. n Toll rates for the public funded BOT projects to be the same. n Toll rate for a two-lane highway to be 70 per cent of the four-lane highway. n Toll rate to be revised @ 3 per cent every year without compounding. n Average distance between two toll plazas should not to be less than 65 km. n The slip for a double-trip journey to be valid for 24 hours from the time of issuance. n A double-trip journey to be charged at the rate of 150 per cent of the single-trip journey. n Basic toll rate for a car fixed at Re 0.35 per kilometer. n Annual Revision @ 10 per cent for seven successive years from April 1, 2011.
n Additional annual revision reflects variation in the Wholesale Price Index (WPI) from January 1 every year. n Distance between two toll plazas not to be less than 20 kilometers.